We've been bringing fun and excitement to the greater Jacksonville area since 1985, by providing ponies and farm animal displays for children's birthday parties, carriage rides for weddings and other occasions, hayrides for festivals and private parties and more. Sheep, Bunnies, Ducks, Chickens, Guinea Pigs and a Calf and Pot Bellied Pig. Everyone is welcome to feed the animals with food we have provided. 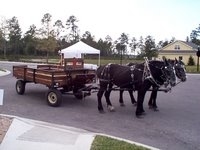 We also offer romantic horse-drawn carriages and fun-filled hayrides. We have a varietyof Vis-a-vis and Victorian carriages. Depending on the size preferences, we have wagons pulled by teams of draft horses or a wagon pulled by a single draft horse. During the December holiday season we have a horse-drawn sleigh. We can travel to your location or you can come to our Bonnie Doone ranch for an on-site event. We enjoy creating beautiful memories for events such as weddings, anniversaries, proms, company picnics, school carnivals, neighborhood gatherings, luminarias and caroling, etc. We take pride in the quality, safety and promptness of the services we provide and we look forward to being a part of your event.